If you’re ever in Munich slot in a few hours at Hofbräuhaus am Platzl, one of the oldest beer halls in the city (hic!). A historic brewery that’s an official part of the Oktoberfest, Hofbräu was founded by the Duke of Bavaria in 1589 and has a very eccentric past involving royal decrees, brewing monopolies, and even a peace treaty that involved 600,000 barrels of HB beer. Today, 427 years since their first brew, HB bottles have made their way to Indian shelves. 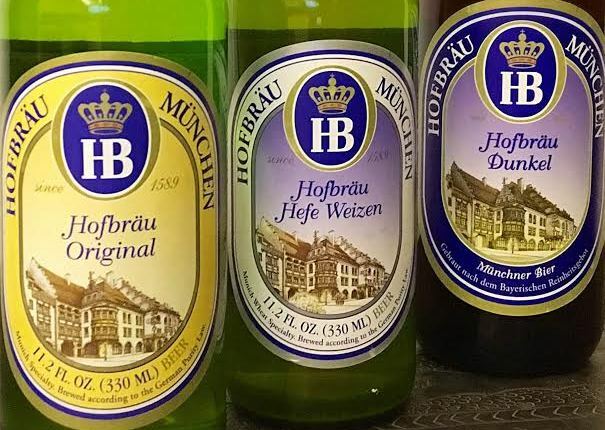 Three variants -Hofbräu Original, Hofbräu Dunkel and Hofbräu Weisse – will be available from July. Over the course of the month, bottles will be supplied to Delhi, Maharashtra, Haryana, Goa, TN, Pondicherry, Karnataka, Chandigarh, AP, Meghalaya, Assam, Uttarakhand. The beers are pricey but if you’re craving those traditional Munich brews that HB does so well, this is your fix. The flagship brew, this Helles or German pale lager pours out a bright golden hue with a nice, fluffly head. On the nose – slightly malty with petrichor (wet earth) and grassy notes. A mildly bitter and crisp, refreshing finish. Alcohol content: 5.1% | Price: 330ml for Rs 350 in Haryana (appx). As far as Dunkels go our only point of reference available locally is the Erdinger Dunkel. Hofbräu’s is very different. Unlike Erdinger’s wheat based brew, this one is the traditional Munich style dark lager made with barley malt. This is currently the only dark lager that’s being imported. This was the first style to be brewed at HB way back in 1589. It starts of with malty, sweet flavours of toffee and caramel, giving way to a burst of spice. Very well-balanced, the beer starts sweet but finishes fairly dry. Smooth, refreshing and though it can’t compare to a fresh pour at the beer garden, it is intensely satisfying. Alcohol content: 5.5% | Price: 500ml for Rs 390 in Haryana (appx). Most believe that HB brewed Munich’s first Hefe Weizen dating back to 1602 at a time when wheat beer could only be made by royal consent. Hofbräuhaus enjoyed this exclusive right, holding a monopoly on wheat beer in Bavaria for nearly 200 years. An elegant wheat beer with typical aromas of banana, clove, and lemon zest.